I have a trainer named WHITNEY who is about 5 foot 9, long black hair, and a megawatt smile. I decided to try working out with her when I visited the West Hollywood Equinox and she said ‘hello’ to me in the locker room. Nobody had ever talked to me at my other gym — and she was magnificent. I watched from across the mat, as she trained another woman about my age, and decided she would be a good fit. Whitney is a cover girl waiting to happen. She’s already won a contest for ‘best body’, and she’s powerful, beautiful and strong. 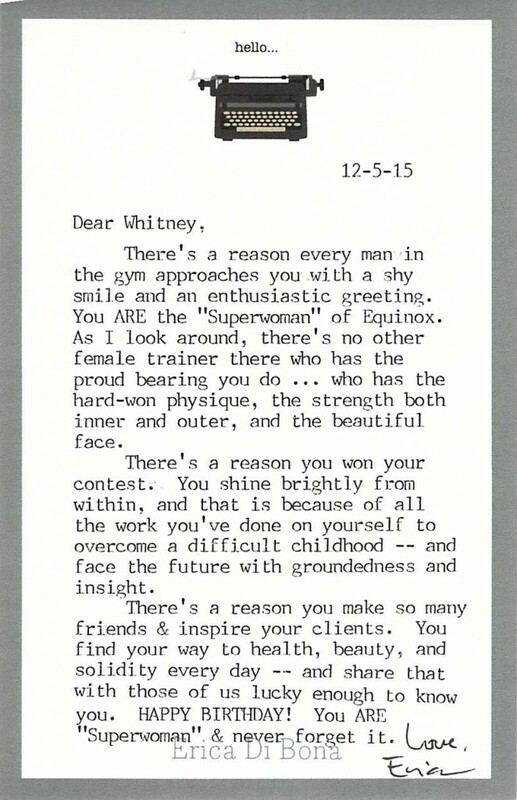 When I saw a “SUPERWOMAN” birthday card, I snapped it up — and added this little note.